The first prototype of GE Renewable Energy's 12MW Haliade-X turbine will be installed at the Port of Rotterdam, the Netherlands, this summer. 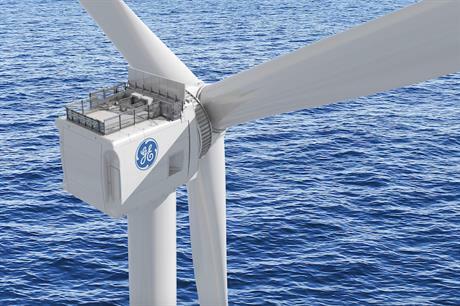 GE confirmed it has signed a five-year testing and 15-year full-service operations and maintenance deal with Future Wind, a joint venture of renewable energy consultant Pondera Development and foundation specialist Sif Holding Netherlands. The Haliade-X turbine, first announced in March 2018, will be trialled onshore in Maasvlakte, a man-made extension of the port and industrial facility within the Port of Rotterdam, to facilitate access for testing, GE explained. The manufacturer will collect data needed to obtain a type certificate ahead of the turbine being on the market in 2021. "As we rapidly progress on assembling the Haliade-X prototype, this announcement is a critical step forward for GE and our customers. "The port of Rotterdam has been a real partner and provides all the necessary conditions to test the Haliade-X in the most drastic weather conditions," John Lavelle, vice president and CEO of offshore wind at GE Renewable Energy, said. The Haliade-X will have a 220-metre rotor, a tip height of 269 metres and a nameplate rating of 12MW. Its nacelle will be assembled at GE’s factory in Saint-Nazaire, France, its three LM Wind Power-designed 107-metre blades will be manufactured at GE’s site in Cherbourg, France, and the tower sections produced in Seville, Spain. The components will then be shipped to Rotterdam for installation. Other tests of the turbine designare due to be carried out in the UK and in France, GE had previously confirmed. A demonstration programme to "replicate real-world conditions" will be carried out at the Offshore Renewable Energy (ORE) Catapult’s test centre in north-east England. Meanwhile, the turbine’s nacelle will be examined at GE’s factory in Saint-Nazaire. The company is investing $400 million (€230 million) in the development of the Haliade-X, which is due to be the largest offshore wind turbine in the world when commercially available in 2021.